Be the first to share your favorite memory, photo or story of Stephen. This memorial page is dedicated for family, friends and future generations to celebrate the life of their loved one. 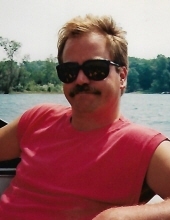 Stephen Michael Stiles, age 63, of Lapeer, formerly Big Fish Lake in Ortonville, died Tuesday, April 2, 2019. He was born April 13, 1955 in Pontiac, to Stephen and Shirley (Martin) Stiles. Steve attended West Bloomfield High School, class of 1973. He married Patricia “Pat” Theeck on June 28, 1986 in Walled Lake. Mr. Stiles worked as a truck driver for American Aggregate in Oxford and Cal Propane/Gas in Keego Harbor. Stephen was an avid fisherman and loved all water sports: water skiing, boating, etc.. He also enjoyed deer hunting and golfing… especially at Hadley Acres. Mr. Stiles is survived by his wife: Pat Stiles of Lapeer; daughter: Alaina Stiles of Lapeer; and sister: Sandy (Gregg) Sherow of Delaware. He was preceded in death by his parents: Stephen and Shirley Stiles. The family is planning a gathering to celebrate Steve’s life in the next couple weeks. Cremation has been entrusted to Muir Brothers Funeral Home In Lapeer. Condolences and memories may be shared at www.MuirBrothersLapeer.com. An informal gathering will take place at a later date. "Email Address" would like to share the life celebration of Stephen Michael Stiles. Click on the "link" to go to share a favorite memory or leave a condolence message for the family.